Product prices and availability are accurate as of 2019-04-18 00:12:04 EDT and are subject to change. Any price and availability information displayed on http://www.amazon.com/ at the time of purchase will apply to the purchase of this product. 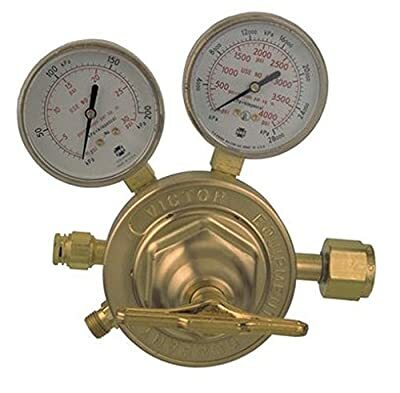 Victor 0781-0584 SR460A-510 Regulator is recommended for applications where slight delivery pressure increases (due to decreasing cylinder pressures) would not affect the performance characteristics of the work or test results. It is for high capacity gas service applications. This regulator has been designed and constructed of a forged brass body and housing cap, 2-1/2" brass gauges, stem type seat mechanism, 3-1/4" diaphragm stainless steel, a delrin cap bushing for smooth adjustments, an external self reseating relief valve on HP Models not designed to protect downstream apparatus and a sintered inlet filter. The performance features are a maximum inlet 3000 PSIG and a delivery range 2-15.